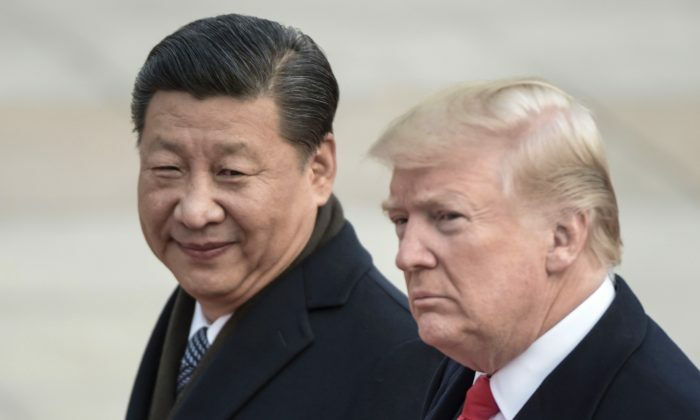 WASHINGTON—President Donald Trump said on Feb. 7 that he doesn’t plan to meet with Chinese leader Xi Jinping before a March 1 deadline set by the two countries to achieve a trade deal. The remarks confirmed comments from administration officials who said the two men were unlikely to meet before the deadline, damping hopes of a quick trade pact and sparking a drop in U.S. stock markets. Trump said previously he would need to meet with Xi to seal a final deal. Late last year, China and the United States agreed to take a 90-day hiatus in their trade war to negotiate an agreement. Another round of talks is scheduled for next week in Beijing. The news prompted a sharp selloff in U.S. stocks, dashing the optimism that had been building that the countries were progressing toward a deal before tariffs on Chinese imports jump to 25 percent after the March 1 deadline. The S&P 500 Index tumbled to its low of the day, down 1.6 percent, in its biggest drop in more than a month. Treasury bond yields dropped as investors sought safety in sovereign U.S. debt. The benchmark 10-year yield slid 4 basis points to 2.66 percent, the lowest in nearly a week. “I could see where that would impact the markets because, obviously, we had a lift in the month of January from optimism surrounding these trade talks,” said Peter Jankovskis, co-chief investment officer at OakBrook Investments in Lisle, Illinois. U.S. Trade Representative Robert Lighthizer and Treasury Secretary Steven Mnuchin are leaving for talks in China next week, one of the administration officials said. The United States is pressing China to make major reforms, including on structural issues related to how it treats U.S. companies doing business there. Washington accuses Beijing of stealing U.S. intellectual property and forcing American companies to share their technology. China denies the accusations. Such reforms have been a sticking point in talks. Lighthizer told reporters at the conclusion of a round of talks in Washington last week that the two leaders may not meet if the negotiations hadn’t progressed sufficiently. Trump has vowed to increase U.S. tariffs on $200 billion worth of Chinese imports to 25 percent from the current rate of 10 percent if the two sides can’t reach a deal by 12:01 a.m. on March 2.